Google has announced “Google for Jobs” this year at Google I/O which is a brand new company-wide endeavor aimed at aiding both job seekers as well as employers through joint-effort with the job matching industry. One of the important aspects of this initiative is to provide job aspirants better exposure through Google Search Engine. This new experience is open now for all developers and site owners. 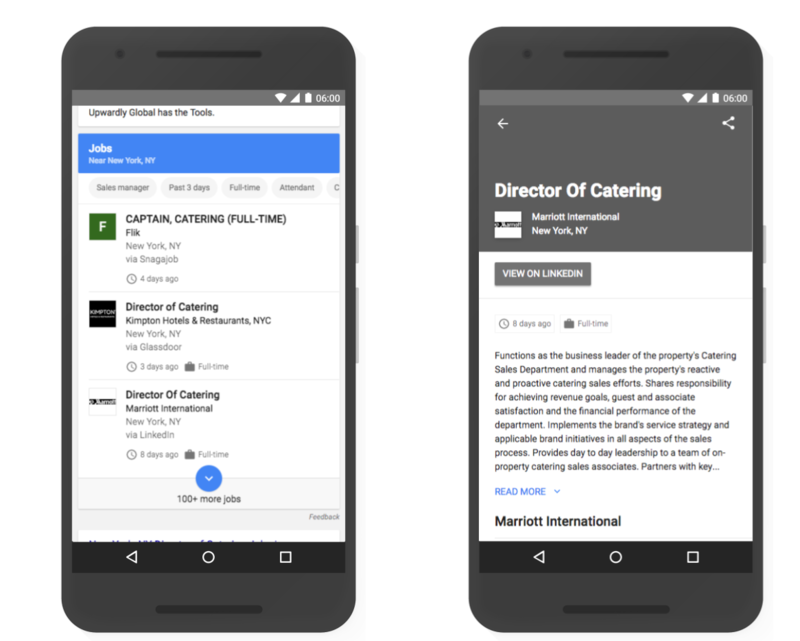 A job listings preview would be shown for queries with clear cut intent such as ‘head of catering jobs in nyc’ or ‘entry level jobs in DC’. Each job can be expanded for showing all-inclusive details regarding the listing. This feature brings a host of benefits and adds a new dimension for employers and site owners with job content. Prominent place in Search Results: The job postings can be displayed in the new job search feature on Google encompassing logo, reviews, ratings, and details of the job. More, motivated applicants: Job filtering feature is present by different criteria which means it becomes easier to sort out applicants and candidates looking for the specific or exact job. Increased chances of discovery and conversion: There would be a new vista open for job seekers to interact with employer’s postings and click through to their site. The job listings are to be marked up with Job Posting structured data. A sitemap (or an RSS or Atom feed) is to be submitted with a <lastmod> date for each listing. If there are more than 100,000 job postings or more than 10,000 changes each day, one can make use of the High Change Rate feature. If job openings are published already on other sites like LinkedIn, DirectEmployers, Monster, Glassdoor CareerBuilder and Facebook, they can still appear in the feature. Making job search an embellished search experience Google has created a dedicated guide to help comprehend how Google ranking functions for enhanced search and practices for boosting the online presence. In Search Console sitemap’s status can be tracked. In Search Console aggregate stats and markup error examples can be viewed. Google would be adding new job listing filters in the weeks to follow in the Search Analytics report in Search Console so that one can track clicks and impressions for his/her listings. The WebPro News Desk brings to you the information about the latest announcements made by Google, Bing and other companies in the search world. In case of any queries You can write to us on info@webpro.in. 43% of marketers say 75% of their content isn’t being consumed. Despite This Survey Result, Why You Should Publish Content Regularly?